GlobeHosting Review 2019: Is GlobeHosting a Good Hosting? GlobeHosting, founded in 2001, provides a comprehensive range of hosting services. The shared hosting plans run on HDD and there’s limited advanced level features, however, new website owners will love the affordability and the beginner-friendly tools. GlobeHosting, founded in 2001, currently hosts more than 40,000 websites. The servers are collocated in the U.S. and Romania, and the company works with Key-Systems GmbH, a German company, to provide services. The website is available in a mix of English and Romanian. The amount of choice available from GlobeHosting is notable. You can choose from servers collocated in the U.S. or in Romania, you can choose between Linux and Window operating systems, and you can choose between e-commerce or regular CMS hosting plans. There are options for all kinds of website owners. Digging into the Linux hosting plans, as these are generally the most popular, you’ll find that the plans use cPanel (which you can demo before you buy), a reliable and easy to use control panel and CloudLinux which, for security, isolates websites in a shared hosting environment with Lightweight Virtualization Environment (LVE) technology. The hardware is robust with branded Dell and HP servers, with RAID 10 configuration. However, oddly, only HDD and not far faster SSD is in use. All plans come with a 99.9% uptime guarantee, although with no corresponding SLA, it’s a bit gimmicky. The plans support a beginner-friendly Softaculous one-click installer with more than 260 programs and, for a small additional monthly fee, RV Site Builder with more than 600 ready-made website templates. There’s even a free CDN to sweeten the deal. Experts may be let down by support for PHP 5.3 (not the twice as fast version 7) and cURL, rather than other advanced coding languages such as Ruby on Rails, Python, etc. The GlobeHosting prices are affordable. The base plan “Initial” comes with 1000MB disk space and 15GB bandwidth for an extremely cheap price. SSL certificates, domain registration, and website building tool are all added extras, but that’s okay given the price. Plans (for hosting and the website building tool) can only be purchased in one or two year terms and there is no discount for purchasing a longer period upfront. Again, it’s understandable with a budget brand, plus there’s a 30-day money-back guarantee, which helps to counter the risk of the relatively long contract lengths. The website does advertise 24/7 support by phone, live chat, and email, however, in my experience, there are a few caveats. First, I could not find a phone number on the website, and, second, live chat was offline when I contacted them during the daytime, mid-week. Finally, I sent them an email (via the offline live chat) and the operator did not respond, despite the fact that I waited four days for a reply. If you like to solve problems without contacting support (or while you’re waiting for support), you’re in luck. There’s a substantial knowledge base with both Romanian and English articles. GlobeHosting, with some big names in its portfolio such as Credit Europe Bank and Banca Transilvania, has been providing hosting since 2001. While experts aren’t really catered to and the uptime guarantee appears to be a bit of a marketing ploy, the plans are affordable with some good value beginner-friendly tools. 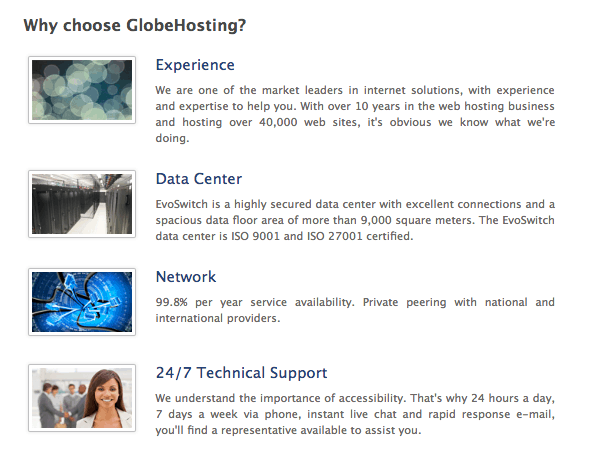 Wondering how GlobeHosting stacks up against other Web Hosting companies? Enter any other Web Hosting company and we will give you a side-by-side comparison.